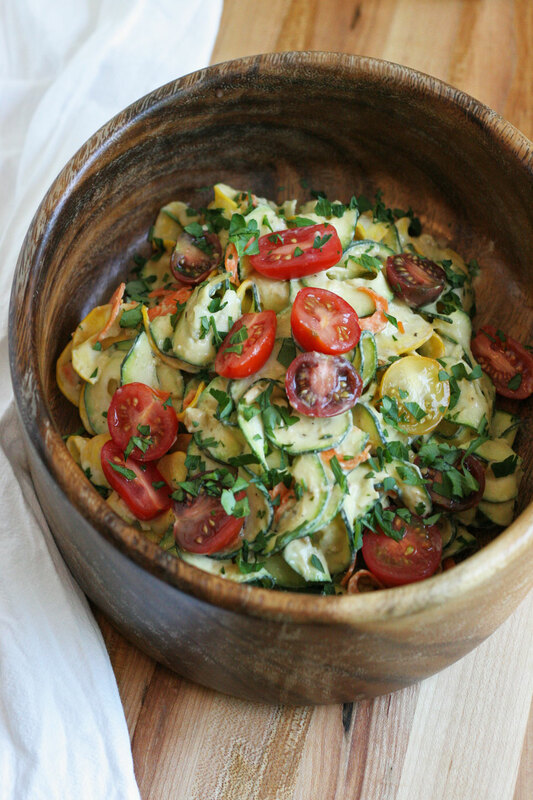 Hello zucchini noodles, and pine nut Sabra hummus dressing, where have you been all my life? Whoa. Have you jumped on the spiralizer band wagon yet? I suppose from the post, you can see, I did. I have been testing it out for some months now, and I am a fan. I must say, this does not replace pasta for me at all. I cannot support it in that way! I do, however, enjoy the vegetables in noodle form. 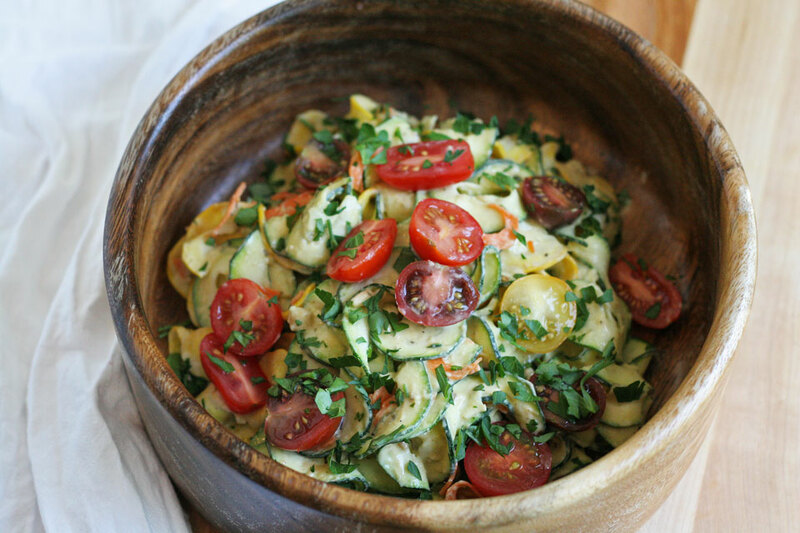 It makes a fun dish, and adds a different texture to the zucchini, which is cool. I also see the flip side, devils advocate, if you will, who needs more kitchen tools in their kitchen if you are only going to use it once in a while? So I will add to this recipe method, spiralizer not needed. Chopping up the zucchini and adding the dressing is just as delicious, and nutritious. That is why I am not showing the spiralizer and its fancy noodles. Can we talk about the dressing though? Seriously, this is where it is at as far as dressings are concerned. I am super addicted to hummus dressing now, and I am just getting started. It has a nice bite with the spicy red pepper flakes, and nutty meatiness from the pine nuts, and all of the good flavor and health benefits from hummus. So kind of a no brainer if you ask me. We can talk salads for a few more months because it is still Summer. I’ll be eating this for lunch today, and make another batch of it in the camping gear when we go next month. It is that good! Since I have been testing the dressing recipe, I have had a jar of this in the fridge to add to all of my salads, it’s super versatile that way. I doubled the batch, and saved it in a jar for my chopped salads for the week. It adds a nice texture to a chopped lettuce salad, so another bonus for making a big batch! Have you ever made hummus dressing? Note: I used the spiralizer on the wide setting. You do not need a spiralizer for this recipe. If you do not have one, just chop the squash and carrot, and enjoy just as well! 1. Spiralize the squash and carrots, or chop. Place in a large bowl with the tomatoes, toss to combine. 2. In a medium bowl combine the hummus, olive oil, lemon juice, salt, pepper, and dried red pepper flakes if using. Use a fork and whisk to combine well. Add dressing to the vegetables, toss to combine. Sprinkle salad with chopped fresh parsley. Serve cold or at room temperature immediately, or on the same day. I do not recommend this salad as leftovers, as the squash releasing too much water the longer it sits. But making it ahead of time on the day you are serving is fine. 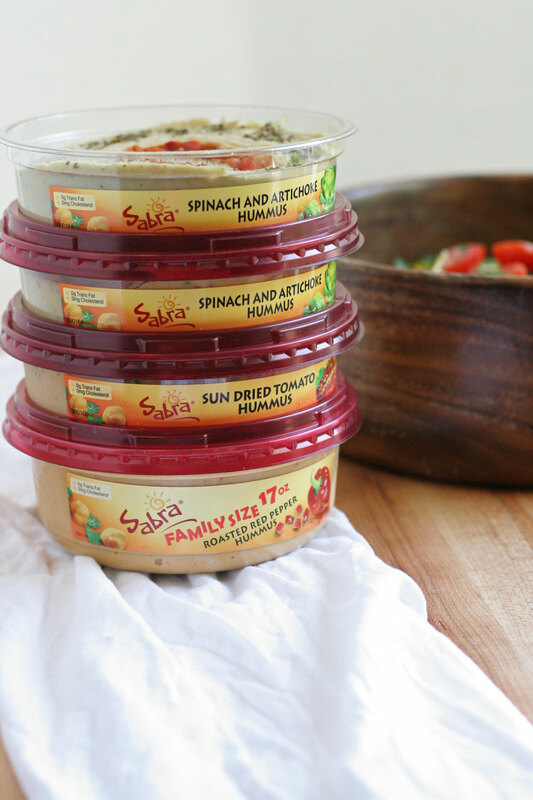 Disclosure: I am a Sabra Tastemaker and I was compensated for this post. As usual, all opinions are my own. What an original idea to use hummus as a dressing! 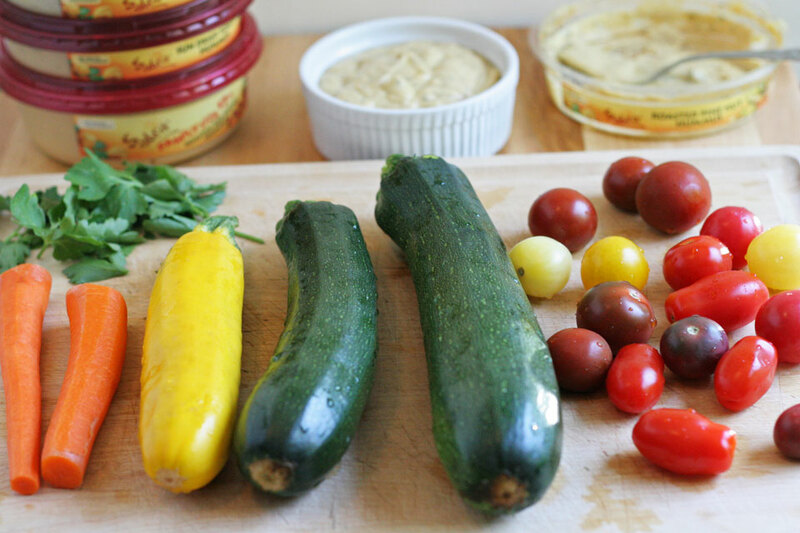 Zucchini and hummus sound like a match made in heaven – I’m going to try this recipe soon. Thanks! Thank you so much! I love using hummus for dressing, I hope you like it too :). This salad looks so fresh and delicious. I can’t wait to try the hummus dressing! Thank you! It is a favorite of mine, now that I’ve made it. It took me so long to use it, that’s kinda why I am on the fence, lol!